Cupcake's Spooky Jackpot Delights | Win up to £2,500! 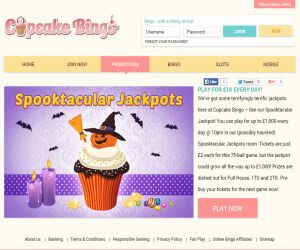 Lord Bingo News Bingo Promotions Cupcake’s Spooky Jackpot Delights! Cupcake Bingo has whipped up some deliciously spooky treats, just in time for Halloween! So make sure you join the cupcake party so you can win your share of the daily jackpot delights, as well as non-stop daily perks and bonuses! Play for £1K Every Day! Cupcake Bingo is firing up the entertainment stakes this Halloween with a mouthwatering collection of jackpot treats. To get in on the thrill-filled action, simply head to the Spooktacular Jackpots room every day from 10pm, and you can win prizes for Full House, 1TG and 2TG wins. The word on the street is that this 75-ball room is haunted. But with tickets for just £2 each, and the chance to win a tasty slice of the £1,000 daily jackpot prize, let's hope you can uncover spook-tastic treasures. When you first sign up to Cupcake bingo and deposit £10, you'll be treated to a tasty 300% FREE to play with £40! plus a super cool a FREE SPIN on the Cupcake Wheel! When you give the wheel a whirl, you could be rewarded with up to mouthwatering £2,500 EXTRA bingo funds! Cupcake Bingo does't just offer indulgent sweet treats for Halloween! When you sign up to the cupcake party, you can expect a tasty stream of bingo perks every single day. Up for grabs are extra bonus prizes, coins and jackpot-blasting treats. You just have to hit the lobby to find out what the daily prize is!